Surveying your employees is a good way to find out what’s going on at the coal-face of your company. You can determine what perceptions are, what morale is like, how engaged your employees are, gather ideas about areas for improvement or efficiencies that could be made, what your strengths and weaknesses are and even what gaps exist when it comes to knowledge, education and training. You can then ask the same questions again in the future - say in six or twelve months - and determine whether or not there has been any discernible change. There is no point in trying to act on feedback if you have no way to measure its reception. Good leaders will ask their staff for their opinions and input and then implement any changes necessary.There’s also a saying that people leave managers and not companies - if management is poor, even if the employee believes in the mission and vision of the company, they are not likely to stay. Delivering employee surveys has never been easier than it is with DeskAlerts. 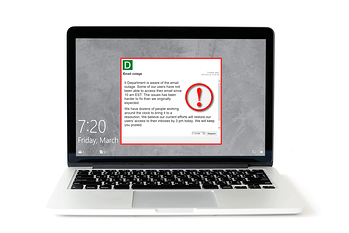 DeskAlerts is a powerful internal communication software solution that improves knowledge and information sharing by sending pop-up notifications straight to employee desktops. Notifications are sent no matter what software the employee is using at the time, bypassing the increasingly unreliable email system, and appear even if a computer is locked, on standby or on screensaver mode. One of the many features of DeskAlerts is its surveys, polls and quizzes module that sends these types of feedback gathering communications to employees also in the form of an obtrusive pop-up notification. Many people have experienced the pain of sending a well-written, well-crafted survey by email only to find that very few of the recipients were seeing it and acting on it. By using DeskAlerts to send your surveys you are literally “getting in people’s faces”. You can also see your survey results in real time. If you’re ready to start surveying your staff, but don’t know where to start, you should come up with a range of questions about working life at your company that they can answer. These are some of the best questions you can ask to really get an idea of what is going on with your workforce. How often do you receive constructive feedback from your manager? How well do you understand the way performance is measured in this organization? Do you feel as though your manager treats you fairly? Do you feel as though your manager cares about your development? Do you feel as though this company provides you with ample training and development opportunities? Do you think management is clear in the way it communicates expectations to staff? How well does your manager communicate the information you need to do your job? How well does management explain the rationale behind decisions that have been made? Are you happy with the way disputes and disagreements are handled? Do you feel as though you have a good understanding of the company’s future goals? Do you feel as though there is a high level of trust and understanding within your organization? Do you feel everyone on your team is treated fairly? How responsive is your manager to suggestions, ideas and requests? How confident are you in your manager’s ability to lead? Does your manager help make the team succeed? How likely are you to recommend working at this organization to another person? How happy are you performing the work that you do? Do you feel proud that you work for this organization? How well do you feel you understand the strategic goals of the company? Do you feel as though you are well paid for the work you do? How do you feel about the number of hours required of you? Do you feel you have the right tools and support in order for you to do your job well and succeed? Do you consider your manager to be inspiring? How do you feel about the team you currently work with? Do you feel there is adequate communication from management to employees? Do you feel you are given sufficient information to do your job correctly? Do you feel you have a solid understanding of the structures and processes that exist within this organization? Do you know who to go to for advice and assistance if an unexpected problem arises? Do you feel clear on how your role helps to meet the organization’s strategic objectives? Do you feel as though you have opportunities for career growth and development with this company? Have you actively looked for work with another organization in the last 6 months? Do you hope you are still working with this company in one year from now? Do you hope you are still working with this company in two years from now? Do you hope you are still working with this company in five years from now? Does your manager inspire you to do your best work? Do you enjoy working with your current team? Do you feel rewarded for the dedication and commitment you display towards your work and the company? Do you feel that your opinions matter to your managers? Do you feel that the management team involves you while making decisions? Do you feel you regularly go above and beyond what is asked of you in your job? Do you feel that the work you do makes a difference to other people? Do you feel confident in solving customer problems? Do you feel that this job gives you enough time with your family? Do you feel all members of your team are treated equally? Do you feel that the policies of the organization are easy to find and follow? Do you feel that the policies of the organization are fair and just? Do you feel stressed by your job? If you feel stressed by your job, how often do you feel stressed by it? If you feel stressed by your job, do you consider it to be an unreasonable amount of stress? Do you think your manager understands the importance of work/life balance?